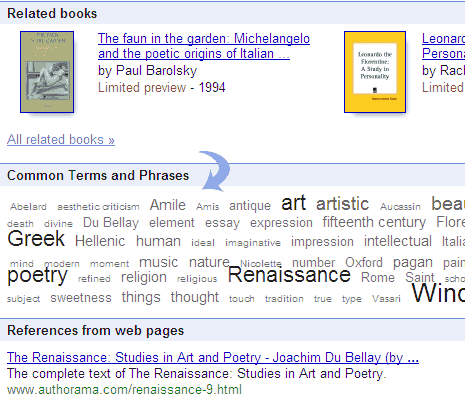 Google Books has added interesting Tag Cloud feature that allows quick exploring of ebook content. On the ebook listing page you will notice Tag Cloud with title “Common Terms and Phrases” [click to see example]. As expected, it shows important and most used keywords, tags, phrases in the ebook currently viewed. More the usage of specific keyword, bigger it will appear in the tag cloud. You can click through any keyword in tag cloud to see more details. It will list out preview of pages with specific keyword highlighted in yellow color. Tag Cloud for sure is very handy addition to Google Books for quickly exploring content of long ebooks without having to click through and jump around pages (in few seconds? OK – few minutes! ).